shared taxies! Easy booking from the website! Taxi departs the airport when all passengers with booking are picked up. *The travelling times from Saga Airport to each destination shown herein are estimation only. *The same rate applies to both adults and children in Saga southern area. *The fare for children aged 11 or under is half the adult fare. *No fee applies to an infant aged 2 or under if he or she is accompanied by an adult and needs no seat (only one infant per one adult). Taxi will be shared depending on the booking and availability. Booking is required. Please book 1-day in advance, until 4pm. 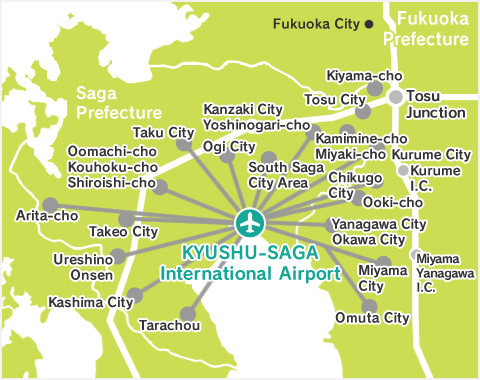 Taxi will be available for minimum number of 1 person, for passengers of all flights which arrive to / depart from KYUSHU-SAGA International Airport. Pick-up and drop-off will be on designated sites. No pick-up or drop-off outside of "available areas." Either of pick-up or drop-off must be at KYUSHU-SAGA International Airport. There is a possibility of cancellation on operation due to extraordinary accidents or traffics. All taxies in Saga Prefecture are non-smoking cars since January 20th, 2009. For details of time schedule and designated pick-up / drop-off sites, please contact taxi companies of each area. Copyright © Limousine Taxi. All rights reserved.